Just like supposedly mortal comic book characters tend to die and refuse to stay dead, the same thing can apparently happen to supposedly immortal characters. This is the case for Kirigi, an enormous and powerful – though oddly quiet – ninja dating back to the introduction of the Hand. 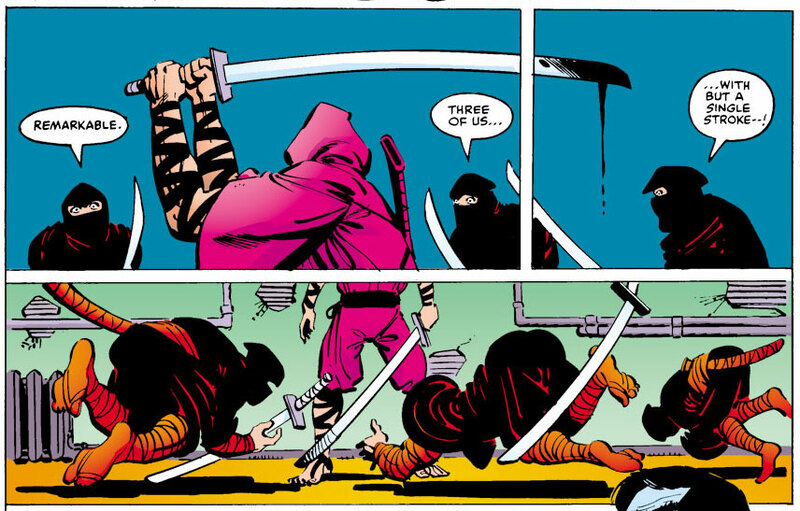 After appearing at the very end of the last issue, Kirigi is introduced again below, in issue #175, in a scene which sees him killing three Hand ninjas with a single stroke. Their offense? 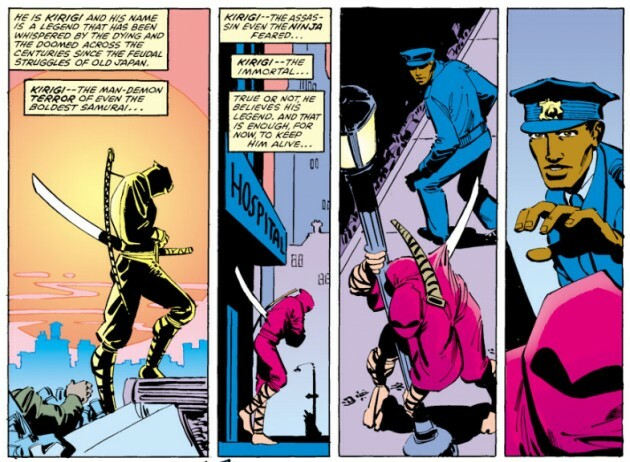 Failing to kill Matt Murdock. I’ll tell you, if the punishment for slacking off at work was that severe at my office, I wouldn’t be writing this. There you have it, Kirigi is the boogie man that ninja parents use to scare their ninja kids. If you’re wondering where Matt is through all of this, he is busy fighting off the other ninjas which have invaded his life and those of his friends while battling the side effects of the Hand’s earlier assassination attempt: the loss of his radar sense. By next issue, Kirigi seems to have recovered. True, he is still walking around with a sword through his body, but that’s a mere paper cut to someone like Kirigi. Seeking refuge in what appears to be a church, Kirigi pulls out the sword from his body and meditates himself back to health. 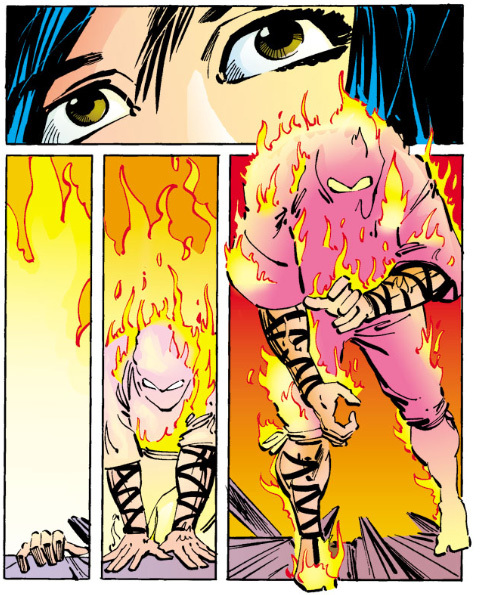 He has to avenge the death of his Jonin, whom Elektra killed last issue (right after pushing Kirigi down the stairs). Their final encounter takes place after Kirigi has stalked Elektra for much of the issue and finally decides to go in for the kill. 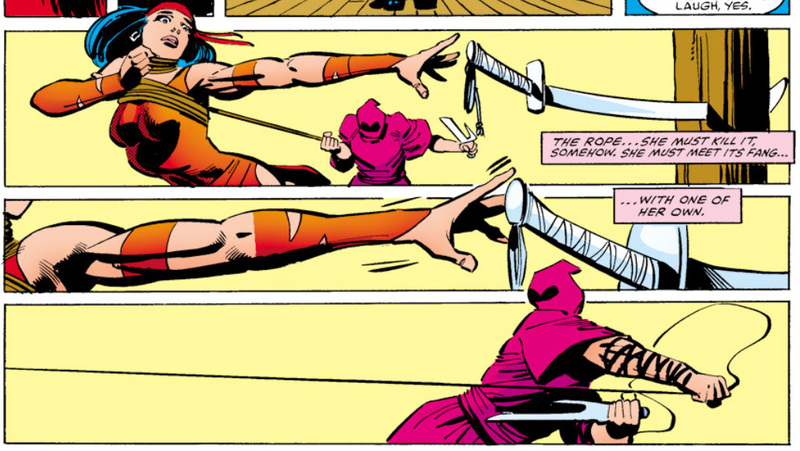 After a lengthy fight, Elektra tries to do him in in a most unusual manner – for a ninja assassin at least – by getting behind the wheel of a truck and running Kirigi off a dock. However, Kirigi emerges again looking like the Human Torch. 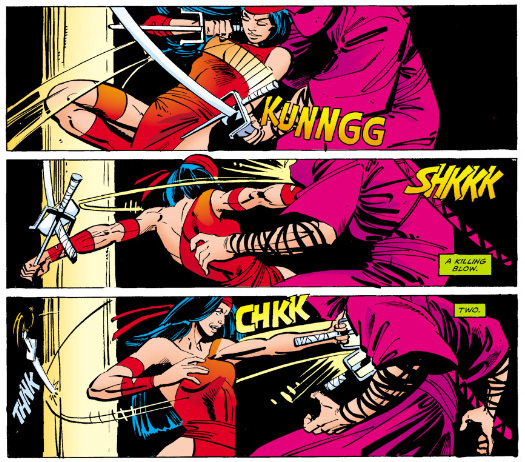 Having tried the sword through body, pushing down stairs and vehicular homicide approaches, a frustrated Elektra finally puts and end to Kirigi’s annoying unwillingness to die, by unceremoniously chopping his head off. And if you’re wondering why I’m not showing you that panel it’s because the decapitation may have been a little too extreme for Marvel, as it happens off-panel. As for Kirigi, he won’t stay dead for long. In another dozen issues, he’ll be fit for fight once again. But that’s for another post. Man, I love Ninjas. What do you think the chances are of them tying in the “Daredevil: Ninja” story arch with the current story line? I could be … “THE DYNAMIC RETURN OF BABY KAREN: NINJA MASTER (not the anti-Christ). Or at least tie-in Stone, he’s cool and under used.